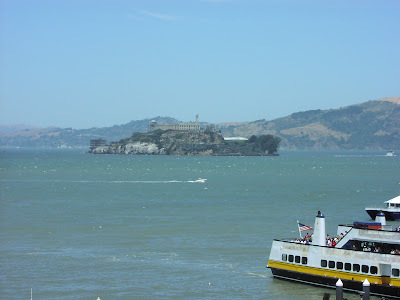 This is a foggy shot of Alcatraz from the wharf area. Its often foggy so don't wait for a sunny day to visit! Its also grimy inside, so be careful what you touch. You need to get tickets from the Blue and Gold fleet (usually a day or so beforehand) to get there. The TransAmerica building, its right downtown. Another shot of colorful Chinatown, which is probably the cheapest place in SF for souvenirs. Moody Monday entry: Fashionable, Bush bashing is very fashionable lately. Coincidentally I took this picture about the same time as San Francisco Daily Photography posted his. Seeing that he did it in black and white, I immediately copied his good idea. His angle makes his picture more interesting. 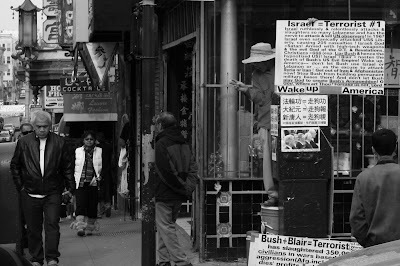 Anyway, the guy stands on that corner in Chinatown quite a bit and waves his signs around. Barbary Coast Trail sign San Francisco California. I thought about cropping the cigarette out, but decided to go with the authentic look. 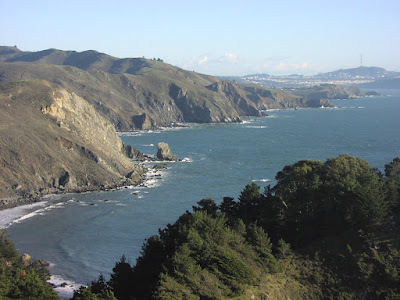 The Barbary Coast Trail is a halfway decent walking tour of San Francisco. 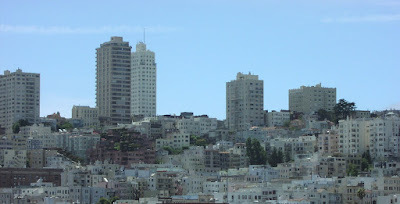 It covers Union Square, Chinatown, North Beach, and Fisherman's Wharf. Some of the stops are a bit obscure, and I hated waiting for the cable car at the end to take me back to the start because there is always a big line for the cable cars. The entire walk is a decent hike, so don't go on it with someone who is not at least halfway into walking or you'll have to stop every block, it is pretty hilly in parts. Dougan's World has more. This is the way my head naturally slants, I just fix the rest of the pictures. The San Francisco Skyline from the East Bay a few days ago. San Francisco from the north. A part of the city as seen from Highway 1 near Muir woods. The golden gate bridge is blocked by the hills. A nice drive on a sunny day. It was a nice weekend! Of the many types of birds that live around the San Francisco bay, I think the pelican is the most interesting. A Christmas tree in a union square shop. Banana slugs of Alcatraz island. Bklasky has more on the slugs. 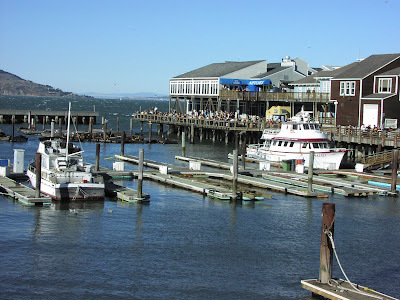 I posted previously on Pier 39 here. San Francisco Pier 39 sea lions. The sea lions hang out by pier 39. Sometimes you get lots like this picture or sometimes you only get a couple rafts full, although lately they're always full. 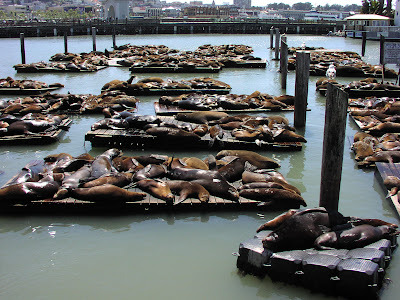 Its generally hard to out-stink a place where fisherman frequent, but the sea lions manage to do it with style. If you have visions of yourself swimming with them like dolphins, forget it, they have known to attack swimmers. Its worth a visit if you're doing the touristy thing, and if you get bit, you'll have a scar to show off to your buddies. John's Blog has more on the area. Golden Gate bridge from east bay. 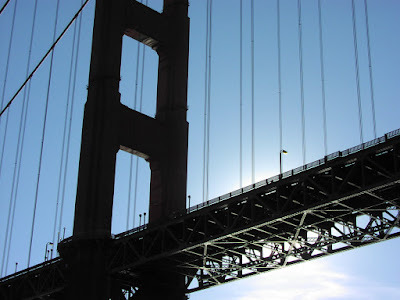 A view of the Golden Gate bridge from an east bay park (Point Isabel, Richmond). I like the clouds over the hill (not sure what its called) in Marin. 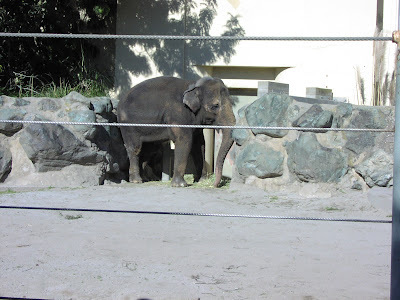 SF Zoo, saddest elephant ever. The San Francisco Zoo is not a known for being a great zoo for good reason. Its out of the way and something you can see in every other semi-major city. I would skip it and all other bay area zoos unless you're a big zoo buff. Rich Burridge's Blog has a lot more information and a bit more at Master of 500 Hats. Its worth the visit even on a foggy winter day. More pictures at Carl Mercier's blog and David Farrar's blog. USS Pampanito in the San Francisco Bay. 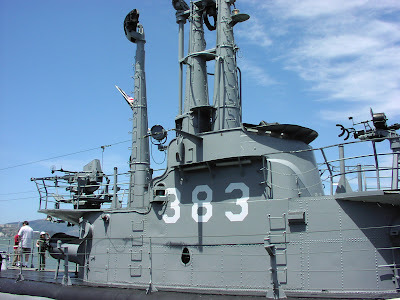 This is a close up of the sub yesterday, the USS Pampanito. 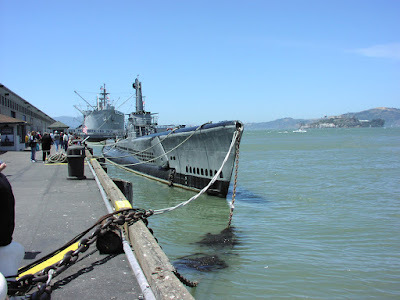 It and the ship SS Jeremiah O'Brien are currently parked at pier 45, fisherman's wharf. I suggest gawking from the pier unless you're a big navy buff. Yelp, John's Blog, and Tangily Mooed's Blog have more. Sub and ship with alcatraz in the background. Golden gate bridge from the bay. Union square San Francisco California. Christmas and palm trees in the same shot! Downtown San Francisco's Union Square is a modest place, with quaint boutiques and hand-made craft shops galore. Oh wait, nevermind that, its a place where you shop until you drop where only the brightest and loudest succeed in getting your attention. Its crowded, but thats part of the fun, who doesn't like silver men doing the robot? Might as well walk around at least once if you visit, its as real as any other part of SF. Take the BART to the Powell Street station to get there. Don't plan on staying in a hotel here unless you think $300 a night is a bargain. Union Square is on the Barbary Coast Trail. 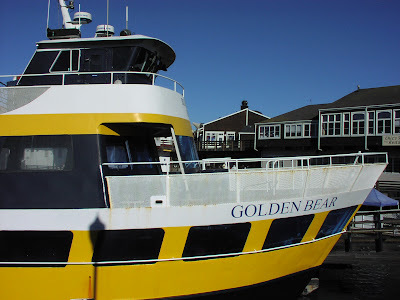 San Francisco bay tour boat. A tour boat parked at the wharf, how many millions of people have these boats taken on their one hour cruise? I posted more about the tours here. There is more from Nodge, who I suspect never had fun in his life. 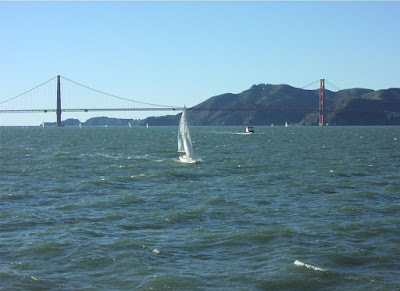 It is generally windy on the ocean though, he's got that right, especially when your boat is racing along at 30mph. The bay is usually calmer but colder in the morning.